Rajinikanth Film Review From Insaniyat Ke Devta. Insaniyat Ke Devta Movie. Rajini Film Insaniyat Ke Devta. 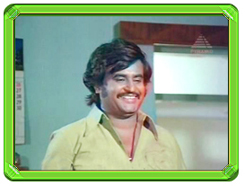 Rajinikanth Insaniyat Ke Devta movie. www.rajinikanth.com. Balbir (Vinod Khanna) and Anwar (Rajanikanth) are close friends who are both honest and brave, and always willing to lend a helping hand to any one who is in need, including the people behind a Ashram (resthouse for the poor). They are in love with two lovely ladies Paro (Jayapradha) and Husna Bano (Varsha Usgaonkar). Balbir's younger brother Vivek (Vivek Mushran) is a student and has fallen in love with another lovely young lady Nisha (Manisha Koirala). Nisha is the daughter of Ranjit (Ajit Vachchani), a rich tycoon who will do anything to take-over the land and property of the Ashram, demolish it, and begin construction on it. He enlists the help of corrupt Jail Minsiter Devi Prasad Bhandari (Raza Murad) and Thakur Shakti Singh (Shakti Kapoor). When Balbir and Anwar frustrate his attempts he has them thrown in jail, and has the Ashram demolished by a bomb, placed by an escaped jail inmate. Balbir and Anwar escape from jail and avenge the demolishment and death of the innocent including Babaji (Satyen Kappu) by killing Ranjit in broad daylight, for which they are arrested and get a life sentence. The jail they are in is in charge of Jailer Rana Pratap (Raaj Kumar) who is a strict disciplinarian, as well as a honest and incorruptible. All three learn to respect each other. Meanwhile Balbir's brother Vivek is framed for the murder of Nisha's mom Sumitradevi (Rita Bhaduri) and he too gets a jail sentence. Balbir and Anwar jail escapades are frustrated by Rana Pratap. Will justice be finally served? Who are behind the killing of Sumitradevi?